Motivate from HON has the perfect solution for your collaborating needs whether it's a day spent in training or a quick impromptu meeting. Liven up your space with fresh new table, chair, and presentation product designs from the Motivate line. These optimal solutions for multi-purpose spaces come with built-in comfort and technology and grant you the ability to react and adapt to change with their flexibility. How would you like to be able to transform a group space into a training room in just minutes? 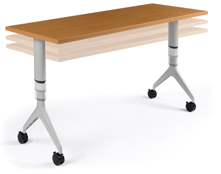 With the Motivate line of tables, chairs, and presentation tools, you can! The Motivate family of products provide a comprehensive solution for any collaborative environment. They work seemlessly together to meet the challenges of today's constantly evolving office environment. If you need to be ready to easily adapt to collaborative needs, the Motivate line can not only do that, but will add comfort and quality to the mix. 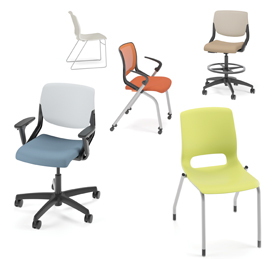 Motivate chairs complement any office design with their wide variety of colors and fabrics. The optional upholstered backs feature long-lasting, durable, wear-resistant fabrics that will allow you to enjoy your chairs for years to come. Let Motivate chairs conform to your space as well as they will conform to your body. Select the design that's right for you! Motivate chairs complement any office design with their wide variety of colors and fabrics. The optional upholstered backs feature long-lasting, durable, wear-resistant fabrics that will allow you to enjoy your chairs for years to come.